Preface. Chapter 1: New Technology and its Application. Three-dimensional miarolitic cavity distribution in the Kakkonda granite from borehole WD-1a using X-ray computerized tomography. The use of X-ray CT to measure the diffusion coefficients of heavy ions in water-saturated porous media. Detection of hydraulic pathways in fractured rock masses and estimation of conductivity by a newly developed TV equipped flowmeter. Case studies of electrical and electromagnetic methods applied to mapping active faults beneath the thick Quaternary. A new technique for rapid and non-destructive measurement of rock-surface moisture content; preliminary application to weathering studies of sandstone blocks. Chapter 2: In-situ Experiments. Stress estimated by using microseismic clusters and its relationship to the fracture system of Hijiori hot dry rock reservoir. Strain monitoring of borehole diameter changes in heterogeneous jointed wall rock with chamber excavation; estimation of stress redistribution. Non-sorbing tracer migration experiments in fractured rock at the Kamaishi mine, Northeast Japan. In-situ experiments on an excavation disturbed zone induced by mechanical excavation in Neogene sedimentary rock at Tono mine, central Japan. Chapter 3: Site Characterization. Seismic risk assessment of an active fault system: the example of the Tsurugawan-Isewan tectonic line. Geotechnical evaluation of conglomerate for compressed air energy storage: the influence of the sedimentary cycle and filling minerals in the rock matrix. Time-dependent ground motion amplification characteristics at reclaimed land after the 1995 Hyogoken Nambu Earthquake. Overview of the stability and barrier functions of the granitic geosphere at the Kamaishi mine: relevance to radioactive waste disposal in Japan. Rates of weathering and temporal changes in strength of bedrock of marine terraces in Boso Peninsula, Japan. Weathering distribution in a steep slope of soft pyroclastic rocks as an indicator of slope instability. Chapter 4: Measurements and Modeling. Soil creep process and its role in debris slide generation - field measurements on the north side of Tsukuba Mountain in Japan. Methodology development for modeling of heterogeneous conductivity fields for a sandstone type uranium deposit, central Japan. Computerized X-ray tomography analysis of three-dimensional fault geometries in basement-induced wrench faulting. Deterioration of water quality in a reservoir receiving pyrite-bearing rock drainage and its geochemical modeling. Five year measurements of rock tablet weathering on a forested hillslope in a humid temperate region. Chapter 5: Rock Weathering and Stone Decay. Mechanism and effect of chemical weathering of sedimentary rocks. Weathering rate of mudstone and tuff on old unlined tunnel walls. Alkali-silica reactivity of Japanese rocks. Effect of porosity on the increase in weathering-rind thicknesses of andesite gravel. Salt weathering of the brick monuments in Ayutthaya, Thailand. Deterioration of stone materials in the Angkor monuments, Cambodia. Comprehensive study of the weathered condition of welded tuff from a historic stone bridge in Kagoshima, Japan. The geology of the Japanese Islands is enormously complicated because of the active tectonism that has taken place on the boundary between the Pacific and Eurasian plates. Geological formations there are intricately deformed and displaced by many active faults. Hence, in planning for and siting large construction projects, such as nuclear power stations, underground power stations, and the underground facility for High-Level Radioactive Waste (HLW), more detailed investigations are necessary than in more stable parts of the world. Only then can assessments be made as to the long-term stability, hydrological characteristics and mechanical characteristics of geological conditions. This book offers recent research studies in engineering geology in Japan. It contains 27 papers of scope and importance sufficient to allow engineering geologists throughout the world to understand more of the present state of research and study in Japan. 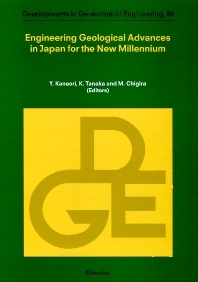 The title also includes a number of current topics in which Japanese engineering geologists have participated: the planning for and siting of large construction, such as nuclear power stations, underground power stations, and the underground facility for High-Level Radioactive Waste (HLW); the construction project of highways and nuclear power stations and new energy developments such as those for geothermal energy; the countermeasures for natural hazards caused by earthquakes, landslides, and slope, and stone deterioration; and alteration because of weathering at and near the Earth's surface.